How do I know if I have Iron Problems with my Water? If your water has a metallic taste or red/yellow colorization, you very well may have iron in your water. Iron can deposit brown, orange or yellow stains on kitchen and bath fixtures, as well as washing machines and clothing. See the EPA Office of Ground & Drinking Water-Local Water Report for information on water in your area. If you have a well or are located in a municipality not listed in this report, you may conduct a water test to confirm the amount of iron in your water. 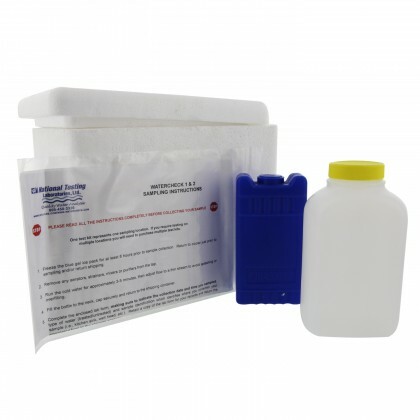 You can contact a state-certified lab for testing, or you can test the water yourself with a water test kit. See the following document for more detailed information about Iron in Household Water. Scroll down on this page for more information on determining whether your water problem is indeed iron. What Level of Iron is safe in my Water? The EPA recommends that safe water includes less than 0.3 mg of iron per liter of water. There are a few different strategies for reducing excessive iron from your water. See the following document for details on Water Treatment for Iron and Manganese Removal. Solution 1: For water with up to 3 ppm (parts per million) of iron and/or if you are trying to avoid as much upfront cost. 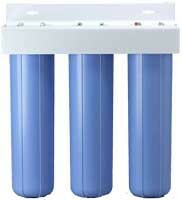 Solution 1 includes 3 stages of cartridge filtration. Use the Iron Reduction Whole House System available below. Solution 2: For water with up to 5 ppm (parts per million) of iron as well as considerable amounts of sulfur, which is usually the source of rotten egg smell in your water. Use the IRON-100DM-WF System available below. Solution 3: For water with up to 30 ppm (parts per million) of iron. Use the W-410-CFA System available below. Solution 4: For water with up to 30 ppm (parts per million) of iron as well as manganese up to 1.5 mg/L. Use the W-410-CFM System available below. See more information on iron water treatment here.